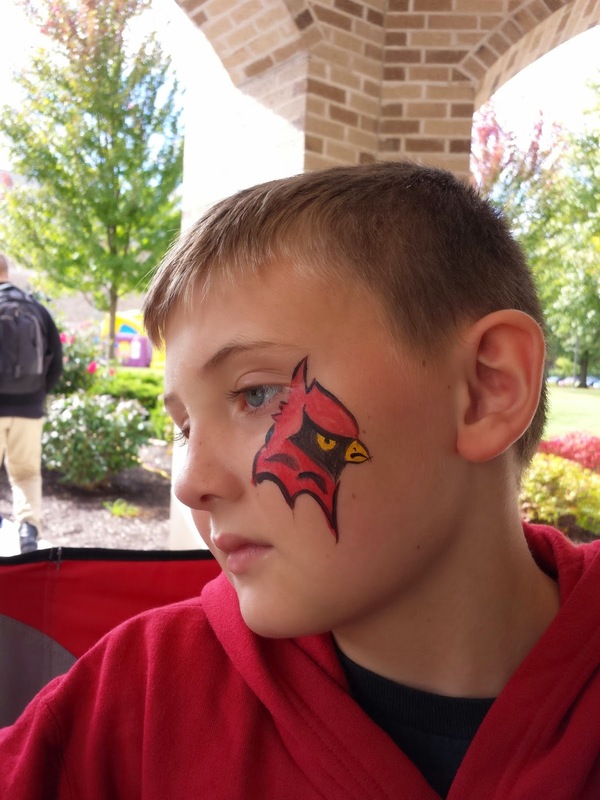 Blue Apple Productions hired me to do the face painting at St.John Fisher College Homecoming for the second year in a row. Such a beautiful campus! Reminds me of my alma mater, Houghton College. It started out rainy but cleared up, and they had a good turn out. I painted about 30 faces while I was there. You can see all of them at this link to my facebook page. My first attempt at doing a cardinal, a special request for the team mascot. Fortunately, he was wearing a sweatshirt that had one printed on it that I could look at. I think it turned out alright. Next time I will start lower in the face so it doesn't run into the eye. :) People are very understand when I'm winging it for them.